Viking Plastics offers a cost-effective solution to challenges caused by parts that require the use of two different plastics. 2 Shot injection molding is a process that molds one part using two different plastic resins. This enabling technology allows you to use two colors of plastics or to integrate both hard and soft plastics into one part without any post-molding assembly. With 2 shot molding, parts can include a clear window, integrated gaskets, movable segments, water shields, or sound or vibration reduction. 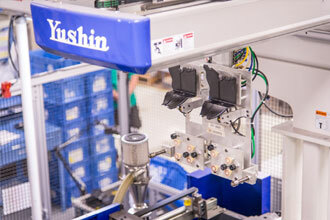 Viking Plastics has a range of capabilities to provide customers with parts via 2 shot molding. This process basically involves molding the first shot to form a substrate. The substrate part is then transferred to a different cavity in the mold by a robot. The second shot of material is overmolded onto the substrate, and then the robot removes the completed part. Viking Plastics’ experienced team can help you select the best materials that meet bonding requirements for the process, as well as advise you on part design to facilitate 2 shot injection molding. Click below to learn more about 2 shot injection molding by Viking Plastics. Founded in 1972, Viking Plastics is a privately held, relationship-based injection molder making a difference in complex customer applications. An ISO and TS certified company, consistently provides unsurpassed quality and technical expertise for caps, sealing solutions and custom molded components. locations in Brazil and China.